For me, this time of year is always ruled by slow cooking. 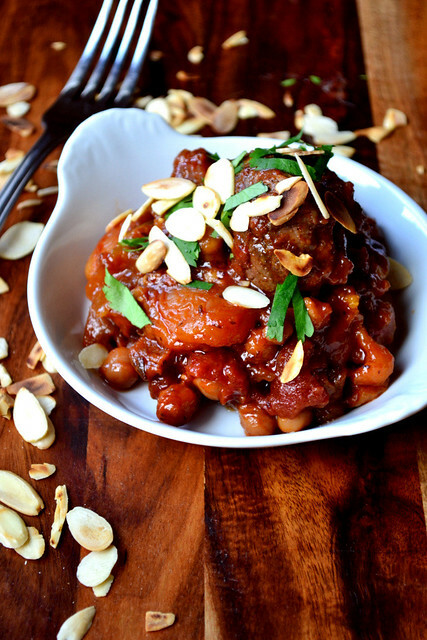 And my recipe for Moroccan Beef and Apricot Tagine is the perfect embodiment of that ideal. 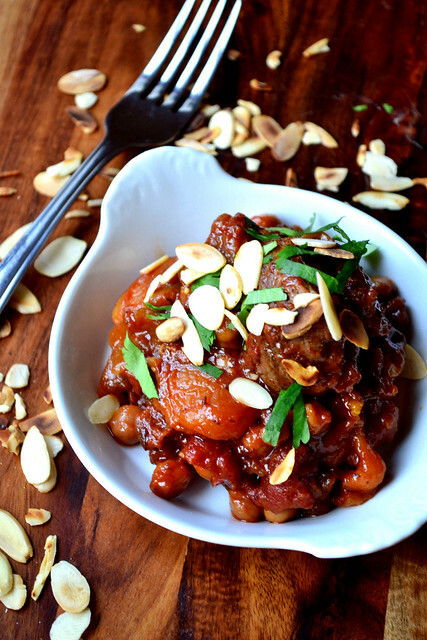 Packed with flavours both savoury and sweet, the complexity of tagine only adds to the comfort it provides. It is, in every respect, a true winter warmer. 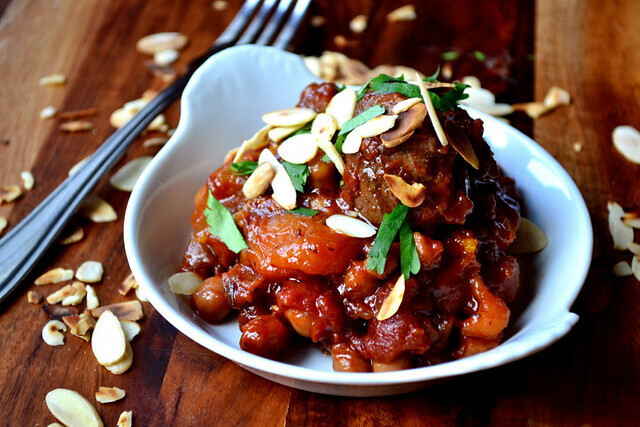 Like most tagine recipes, the example below is brimming with powerful ingredients that somehow come together, with the help of a generous cooking time, into a casserole fit for any plate. It’s culinary magic. The icing on the cake is the use of top-quality meat. Beef shin is an excellent cut for this dish. Perfect for slow cooking, the marrow within the bone helps to enrich the sauce in the tagine. Bone marrow may not sound delicious, but it has become a heavily undervalued ingredient. If you can’t find good quality shin (bone on), ox cheek would also work incredibly well, as would stewing beef. Be warned, however, that the latter may not convey quite as much flavour. As usual, Source in Bristol didn’t let me down. Heat 2 tbsp of olive oil in a large pan and seal the meat. Transfer to a large casserole or tagine, holding back the fat and oil in the pan. Preheat the oven to 160C/140C(fan). In the same pan sauté the onion and garlic until softened. Tip in the paprika, stock puree, tomatoes, apricots and dates and cook for 5 minutes. Transfer the contents of the pan to the casserole, along with the cinnamon stick, chickpeas and salt. Distribute evenly, cover and pop in the oven for 2-3 hours. The dish is ready when the meat is soft and falling off the bones. Discard the bones and serve with toasted almonds, fresh coriander and couscous. Cost: How much your tagine costs will depend on the type and quality of meat used. Stewing beef can be very cheap, but good quality shin is a little more expensive. Still, at a maximum price for around £8 per kilo your rendition is almost guaranteed to be frugal. It shouldn’t set you back more than about £7.90, all ingredients considered. Sounds delicious, I am going to try this, this week. Please do – I hope you enjoy. It’s obviously Tagine Time … I made a Moroccan Lamb and Date Tagine the other night for friends, from Nigella’s Christmas book. Same principles – low-price cut of meat, sweetness in the dried fruit, and some gentle spicing. There was also a nice red onion/pomegranate relish. It was lovely but I like the addition of chick peas in your recipe, and I also fancy the chicken and butternut squash version. Thank you for affirming the virtues of frugal cooking! Sounds delicious! Perhaps I should try a red onion and pomegranate relish myself! Thank you for reading! Lovely tagine Nick. It looks like a real rib sticker. Excellent. It was so nice, Conor – thank you. 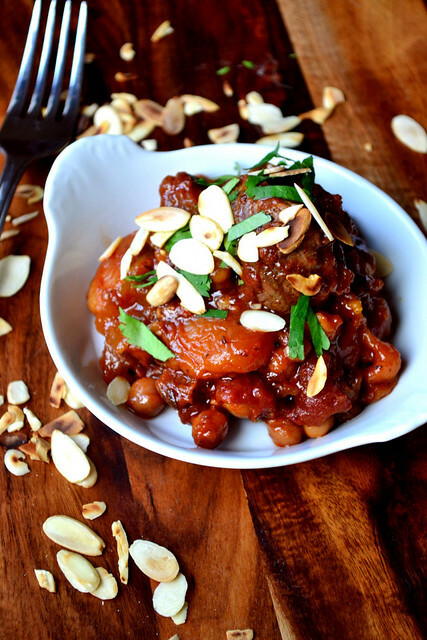 Yep, definitely tagine time – made a chicken and fruit tagine last Sunday….then saw your recipe! That sounds gorgeous too. I think I’ll have to make another soon.